It doesn't matter what name is applied to this chair. Sometimes we called it Daddy's chair because he ended up sitting in it when the family gathered. I believe that its history began in Mama's family at an unknown date. It looks 1930s to me. But it has been refreshed in many ways over the decades. 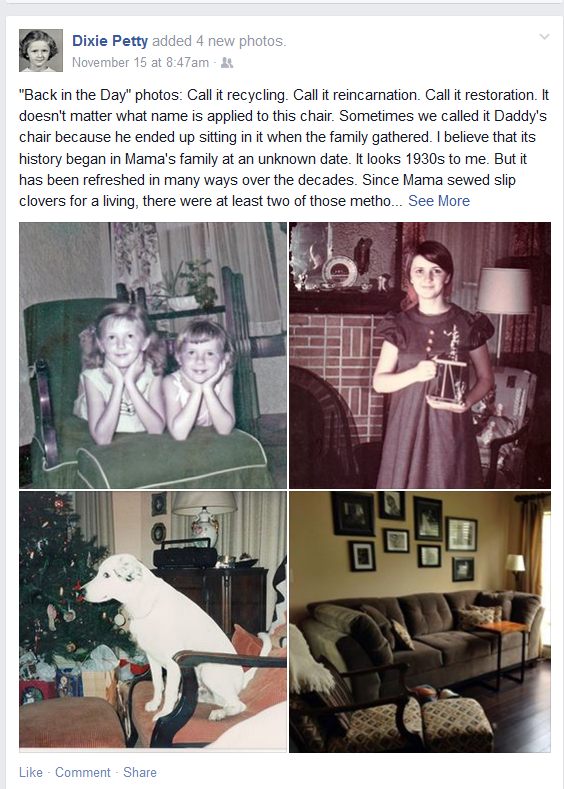 Since Mama sewed slip clovers for a living, there were at least two of those methods used to give new life to the old chair and ottoman. I never liked the slip cover you see behind me in photo of me with my one and only trophy for an Oral Interpretation Contest in college. When my parents renovated the house on 15th Avenue to live in, Uncle Walter reupholstered the chair. That was his area of expertise. Currently the chair has a renewed life at Lydia's home. She reupholstered the chair once more in fabric that Mama had actually chosen many years ago. So yes, I would say that reincarnation does exist if slipcovers and upholstery tacks qualify. If you've got a a picture of a talking chair, a grandfather clock, a family pet, or an old Studebaker, then SHARE THE MEMORY with your extended family, and SUBMIT your entry in Ol' Myrt's 3rd Annual SHARE A MEMORY CONTEST. The deadline is Sunday, Nov 30, 2014.